The consensus seems to be clear that the Big Ten and Pac-12 are the top two conferences in NCAA Division I women’s volleyball. That’s what makes the Big Ten/Pac-12 Challenge so intriguing, as the top leagues put some of their top teams to the test by clashing with each other. Sure enough, that provides us with a foursome of #2 Stanford, #4 Minnesota, #9 Penn State and #18 Oregon, with the Cardinal hosting the action. With such a big event, let’s take a preview at the quartet of matches among the schools. This is the first real test for the Golden Gophers, who have played a solid Florida State team but even they have a losing record. In total, Minnesota’s opponents thus far in victory have gone 9-19, so this week is their best barometer so far of where they are at. It’s also a test for Oregon, who has tons of talent from several consecutive recruiting classes, but are still looking to come together and breakout. What could determine the match? If Oregon struggles with set location and passing, they will be in trouble against the Golden Gophers and their wealth of options. The Ducks have racked up some impressive overall offensive numbers early in the year, but mostly from last week in four matches against lesser opponents. They’ve also yet to really establish their block, which will need to be cleaned up against a Minnesota offense that is hitting .310. The Golden Gophers meanwhile have blocked at 3.41 blocks per set, but will be more challenged with the different attackers that Oregon has. Johnson is hitting .430 on the young season, including a .517 mark against Texas when she had 17 kills. She’s been getting more involved with the block lately too, which she will get a chance to boast on her right pin and Minnesota’s left – which could feature several different players that provide different aspects for the Gophers. The leader in points per set on the Ducks, Stone gives Oregon quite the presence on both ends in the middle. Not only is she hitting .342 with 2.95 kills per set, but leads the team with 1.16 blocks per set. Her numbers were lower against Texas and Nebraska though, so it’ll be a test of if she can keep it up against the best. With Alexis Hart not playing lately for whatever reason, Rollins has not just stepped up defensively in the back row but also with some pop up front. Last week she averaged over two kills per set and hit over .300 in all three matches. Her growth should continue, but this will be an early challenge for the youngster. Oregon has strong assist per set numbers, but there’s something left to be desired in ball placement. That’ll be different with Minnesota, as Seliger-Swenson finds strong locations in many different situations. She could provide one of the bigger positional advantages for the Golden Gophers in the match. This was close to being the National Championship match last season, but instead it winds up being a pair of teams who fell just short in the Final Four. While one team – Stanford – has the majority of that team back, the other – Penn State – is almost completely new. Beyond all of that, it’s a battle of volleyball blue bloods, which is awesome on its own. This is the first high-pressure match for Penn State, so how they keep their bearings will be key. Both teams have blocked at a high rate so far too, which shouldn’t bother a veteran Stanford team as much but could be worse for Penn State with some young players and playing on the road. The Cardinal need to serve more aggressively though to keep Penn State out of system, making their serve and Penn State’s serve receive maybe the most critical part of the match. Leath has been around and played in some high-pressure environments, so she will help in terms of leadership with some of the young Nittany Lions. Additionally, she leads the team with 3.37 points per set and is hitting .263. She will be a go-to option in key moments for Penn State on the road. The assist per set numbers rose from week one to week two for Weiskircher, who had her top performance against Texas A&M. She’s an older player and as the setter will be counted upon to lead and calm everyone down in a tough match and environment as well as battle with Jenna Gray on the other side. A transition to the pins has gone very well for Fitzmorris, who is second on the team in points per set (3.44). She’s providing 1.18 blocks per set, which could help limit the senior outside hitters for Penn State, but also has been unstoppable in termination at hitting .460. Hentz is putting up 4.29 digs per set, but it’s also about some of the unbelievable athletic endeavors she achieves to save a ball that can be demoralizing for a defense. She could make things very frustrating for some of the Penn State youngsters. If Oregon can’t get it done, they’ll have one more chance against Penn State to notch a top 25 victory. For Penn State, they’ll either be riding high from a win over Stanford and appear as a top level team or they’ll be looking to rebound with a young core against a solid ranked opponent who isn’t at as high of a level. Does Oregon look more like the team we saw in the opening weekend or the one we saw last week? If that’s the case, their serve and offensive balance could cause problems for Penn State, especially in testing the young middles. On the flip side, the Nittany Lions strong block could help slow the Oregon offense and if Penn State gets their serve going to pair with it, it could make life really difficult for the Ducks. Additionally, if the Oregon block struggles, Penn State has a lot of thumpers who will terminate. Gill is hitting a blistering .541 and is second on the team with 0.95 blocks per set. In the team’s two meetings with top 10 opponents though, the blocking fell while she still hit around .400. That means she should be quite the challenge for the young Penn State middles to slow down, but at the same point in time they’ve been elite at blocking so far so should challenge Gill. The Ducks haven’t gotten as consistent of play from the outside hitter position as other hitters and Vander Weide is hitting just .130. Still, she’s the most used left side for Oregon and so becomes very important against the physical front line of Penn State. She has to be on her ‘A’ game to provide more balance and not allow Penn State to just key on a few Ducks. One of many talented youngsters on Penn State, Gray is hitting .400 and averaging 1.55 blocks per set. Now comes the question of if it was all about the competition or if that can carry over against a really good pair of Ducks middles (as seen above). Reed is another member of the class in their final season that is meshing with the youngsters. She’s second on the team in points per set and is first in kills while hitting nearly .300. Her offense will be counted upon all weekend on the pins along with Leath. If all things go according to the higher ranked team, this could be the creme de la creme of all of the matches on the weekend. 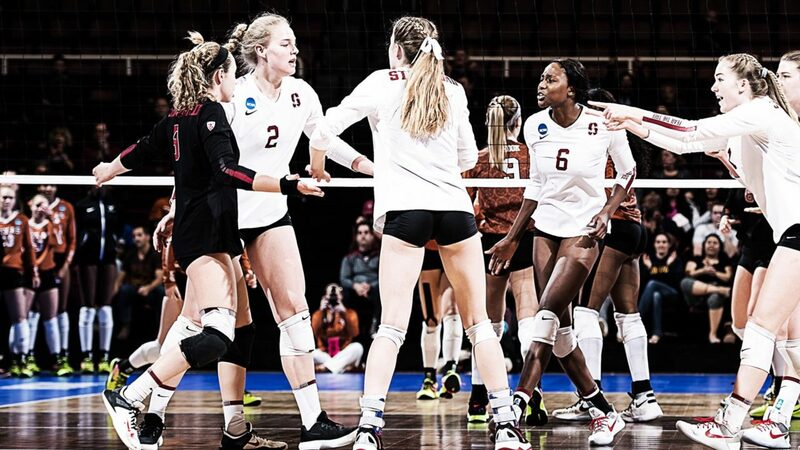 A 2-0 week for Minnesota could push them to #1 in the VolleyMob Top 25 while Stanford can show the BYU loss truly was just a road slip-up against a great opponent. Beyond that, it’s a Final Four rematch from 2016. The setters will be key to both sides and each has a National Player of the Year candidate who will be relied upon in Samedy vs. Plummer. Each team has a bit of a positional battle too, between the second middle for Stanford against the outside hitter position for Minnesota. Who finds more production there will loom large. Each of these teams have elite offenses too and have blocked well so far, but haven’t found a ton of rhythm serving, so if either can do that and whoever wins the serve receive battle will likely claim this match between heavyweights. When Plummer or Fitzmorris or McClure is lined up on the left pin, what a cross-court matchup that could be with Samedy as the right side. She’s the team’s top attack option averaging nearly five points per set and will be relied upon in clutch situations playing at Stanford. Stanford has talent in the middle, but they’re still figuring out their best option to pair with Tami Alade. Pittman will make that even more important as she is averaging 3.27 kills per set out of the middle while hitting .483. She’s also averaging 1.33 blocks per set, which will be counted upon against the Cardinal’ firepower. What a setter matchup we have in store in this match between Gray and Seliger-Swenson. It should be a battle between two of the very best in the entire nation, so keep an eye on set location and the ability for each setter to squeeze their team into a better shot when out of system. This one is obvious. AVCA National Player of the Year. 6’6″. Six-rotation Player. Still, we’ve yet to see her fully ramp up as she is hitting .237 on 4.41 per set. If Stanford can pass well, Plummer could feast but will be in line with some great matchups on the other side of the net.